The hubs and I are about to embark on a little mountain getaway (Canadian Rockies, here we come! ), and I was thinking of what I’m packing and how that relates to my readers (hi friends)! It’s not yet ski season, and let’s be honest, I mucho sucko at skiing, so we’re hoping for a nice combo of outdoor adventure mixed with sitting by the fire and enjoying peace and quiet! A sturdy hiking boot that doesn’t look like a hiking boot. These can still be worn to a casual dinner. I don’t know about PSL season, but it’s definitely dry shampoo season! Dry shampoo helps me eliminate the need to wash my hair everyday- or get rid of the post-flight grease- which is soooo handy when traveling! I’ve tried a few different kids and would you believe this cheap one from Suave is my favorite for scent and not leaving white streaks in my hair! Clif energy bars are a favorite among my husband and I. All-natural ingredients + curbing our hunger without a crash! Here’s my packing tip for summer & winter. Lean in close: Pack. Scarves. You can wear the same outfit for 2 days straight if you change your scarf! (You’re now questioning my personal hygiene)! I’m pretty obsessed with the Kindle Fire HD. It’s affordable, the battery has a good life, and I can listen to podcasts while I workout, or read a book on the plane. 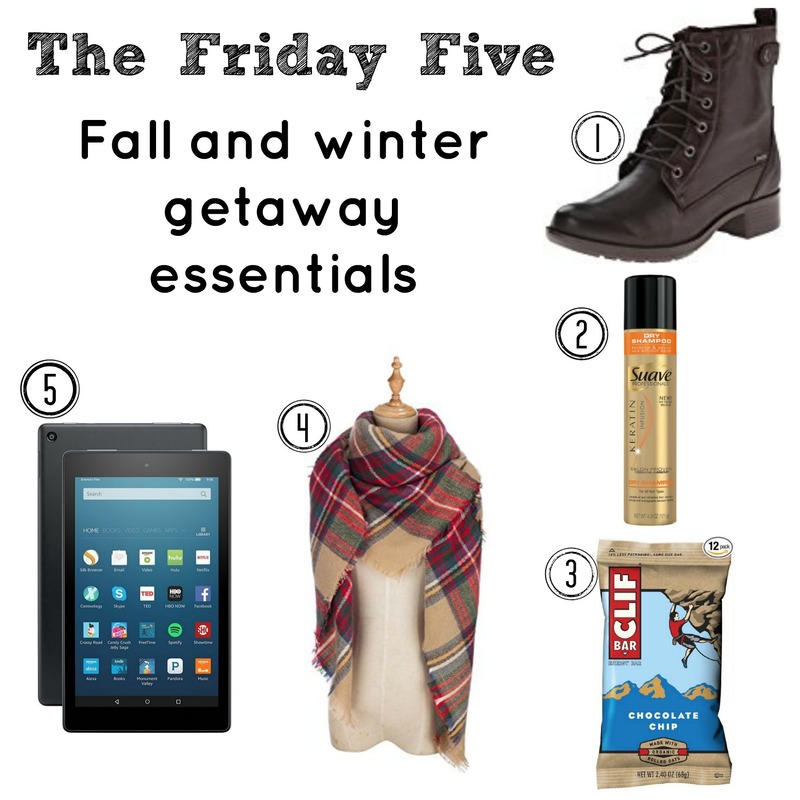 What do you pack for a fall getaway? Have you been to the Canadian Rockies? Maybe you struggle to wash your hair everyday, too? Great essentials! I do a lot of day trips in the fall and winter, and the weather is unpredictable to say the least. I like having a lightweight shell jacket that is versatile enough to pair with heavier layers (think fleece) or lighter options. I also want the jacket to be somewhat rainproof so I can skip the umbrella. I like several models from The North Face, and have found that the price is worth it. Another essential, for all seasons, but especially as the weather gets cooler and mitten season approaches, is a reusable bag. I’ve picked up a few lightweight nylon models from grocery stores and even GAP. My favorite has a cute blue and white design and folds back into itself. I always carry one inside of my purse on trips and love when I can put it to use and double my storage capacity. Love the idea of the bag, Katie! That’s something I don’t think of enough and always get caught without one. I just stuffed one in my laptop bag! I have a light windbreaker for layering, but I just bought a 32 degrees down jacket with a hood that folds up into a tiny bag! It’s seriously brilliant considering when we leave here tomorrow for the Canadian Rockies it will be about 70 and when we arrive it will be 40. I’m stashing that in my carry-on and whipping it out when we get there.